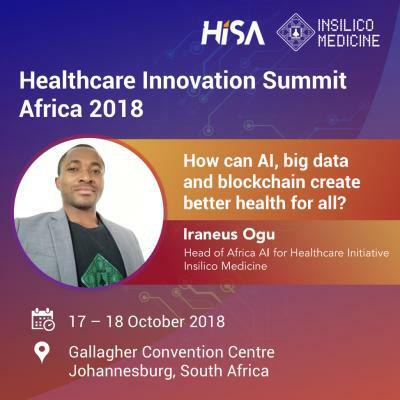 Thursday, October 11, 2018, 2018, Rockville, MD – Insilico Medicine, a Rockville-based leader in next-generation artificial intelligence for drug discovery, biomarker development, and aging research, is pleased to announce the talk of its Head of Africa Artificial Intelligence for Healthcare Initiative, Iraneus Ogu, who will present alongside other academic thought leaders and industry experts at the 4th Healthcare Innovation Summit Africa 2018 (HISA), one of the largest healthcare events in Africa. The talk "How can AI, big data and blockchain create better health for all?" on the 17th of October, 2018 will be devoted to the recent advances in AI tending to become a growth engine for African biopharmaceutical industry and transform the R&D in local pharmaceutical companies. The talk will also focus on the challenges of African pharmaceutical sector and educational opportunities for building the strong local teams interested in the application of AI in the Healthcare sector. "Thinking about global developments, it seems we now have a window of opportunity to utilize current advances in tech globally to help transform Africa. From the way things are going, it would be very disappointing if we can't take advantage of tech developments to move Africa forward in meaningful ways especially in healthcare", said Iraneus Ogu. "We are very happy to present our work at the Healthcare Innovation Summit Africa 2018, which brings together the many key stakeholders from the public and private healthcare sector. Africa is often overlooked by the top AI startups but we want to develop interest and talent in the region and educate the local scientists on the value and the possible uses of their data. The topic of Longevity and Artificial Intelligence for pharma R&D is rapidly gaining popularity and we are happy to be at the leading edge of research and one of the innovation drivers in this area", said Alex Zhavoronkov, Ph.D., the founder, and CEO of Insilico Medicine, Inc. This conference will tackle hot topics such as robotics, electronic health records, delivering personalized healthcare, artificial intelligence, IoT in healthcare, driving down the cost of care with technology, security, legal impact of eHealth, healthcare policy, telemedicine advances, future of healthcare and much, much more. Insilico Medicine is regularly publishing research papers in peer-reviewed journals. The company was first to apply the generative adversarial networks (GANs) to generation of the new molecular structures with the specified parameters and published a seminal peer-reviewed paper submitted in June 2016. The concept was further extended and augmented with advanced memory and reinforcement learning. The paper published in Molecular Pharmaceutics in 2016 demonstrated the first proof of concept of the application of deep neural networks for predicting the therapeutic class of the molecule using the transcriptional response data, received the American Chemical Society Editors' Choice Award. One of the latest paper published in the Journals of Gerontology demonstrated the application of the deep neural networks to assessing the biological age of the patients. Insilico Medicine is an artificial intelligence company headquartered at in Rockville, with R&D and management resources in Belgium, Russia, UK, Taiwan, and Korea sourced through hackathons and competitions. The company and its scientists are dedicated to extending human productive longevity and transforming every step of the drug discovery and drug development process through excellence in biomarker discovery, drug development, digital medicine, and aging research. Insilico pioneered the applications of the generative adversarial networks (GANs) and reinforcement learning for generation of novel molecular structures for the diseases with a known target and with no known targets. In addition to working collaborations with the large pharmaceutical companies, the company is pursuing internal drug discovery programs in cancer, dermatological diseases, fibrosis, Parkinson's Disease, Alzheimer's Disease, ALS, diabetes, sarcopenia, and aging. Through a partnership with LifeExtension.com the company launched a range of nutraceutical products compounded using the advanced bioinformatics techniques and deep learning approaches. It also provides a range of consumer-facing applications including Young.AI.